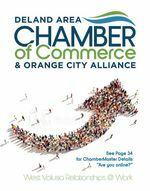 Thank you for your interest in becoming a member of the DeLand Area Chamber of Commerce & Orange City Alliance! Please complete the following member information. General Business / Manufacturers 100+ employees: Please contact us to determine the fee.